You’ll find my blog to be a wealth of information, covering everything from local market statistics and home values to buyer and seller tips. Please reach out if you have any questions at all. I’d love to talk with you! If you are preparing to sell your home, you already know about the concept of staging, and if you're on my website, you know that your home should STAND OUT. While others ignore the minor details, you will not, and your home will stand out compared to the competition. While most people think about pretty flowers in the front yard and the perfectly set table in the dining room, the fact is that staging is much more than nice lifestyle elements. Staging is something that should be considered throughout the home. It’s creating a scene in which your buyers can envision themselves living their life in your home. Most importantly, your organization and decor demonstrates that you care for your home and haven't skipped out on any major maintenance items. Declutter and Remove – Yes, that old adage that "less is more" when it comes to home staging is true here too. Remove anything you don’t absolutely need, and pack away seasonal items. You should be moving before you'll need the next season's clothes! nice, new, matching hangers creates an organized look. shelf or rack if possible. organized. Once you have them arranged by color, then group by length as well. more inviting. Turn these lights on during showings! Staging is essential to attract home buyers. 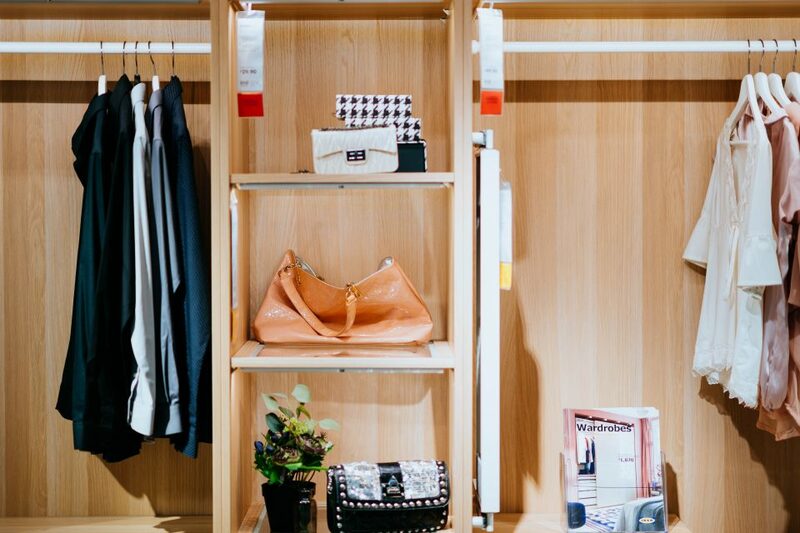 As part of your overall strategy, remember closets, drawers, and other small spaces which might not seem as important, but done well will make a big impact to your buyers. Buying a home can seem like a huge undertaking. You don’t need to be a first time home buyer to find the process overwhelming. There is so much information available, and a lot of myths. Below are some common ones I see. Before you head out shopping, speak with a lender to understand your financial options and how much house you can afford. Most importantly, get pre-approved! There's nothing worse than falling in love with a home you can't afford! There are many loans available which still offer good interest rates for those without that perfect score. While most loans require a 620 FICO score, you may qualify for a loan with a FICO score as low as 580. If you're a veteran, VA loans can be used for 0% down! Not a veteran? You may be able to finance your home with a Rural Development loan, also at 0% down! Credit not the best, or have some debt? FHA offers 3.5% down. There are other programs too, and some conventional loans with less than 20% down also. A real estate agent not only knows the market and can help you with value, but also customary charges, negotiations and solutions to common hiccups. For buyers, real estate agents are FREE in most instances. The neighborhood is always important to home values, regardless of whether you yourself have children. Homes located in zip codes with great school districts typically increase in value more. You may plan to live in your home forever, but life can be unpredictable. Purchasing a home is an investment, and it's important to consider how things like location, odd layouts, etc. affect the future value of your home. Much like Cumberland County, median sales price and number of homes sold in the first quarter are both down from a year ago! Last month's rolling quarter stats showed sales prices at an increase of 6.89% over a year ago, while Cumberland County saw a leveling off. Does this mean it's the beginning of a slow down? I'm hesitant to come to this conclusion. The first quarter tends to be the slowest time of the year for real estate transactions in Maine every year. While I have heard agents around the office and in the field saying it's tougher now to sell homes than in the past, and I've experienced a few challenges this first quarter, I'm not convinced. I still have the feeling that it's seasonal. I know, this is about statistics and not "feelings"... If we still see sales prices dropping in the second quarter, I will have no choice but to jump on the "the market is slowing" bandwagon. Maybe I'm wearing rose colored glasses, maybe I'm in denial of the statistics, but for now I remain unconvinced. Number of Sales: The number of properties sold. Median Sales Price: The midway final price of all properties sold. Half sold for more, half sold for less. Median Days on the Market: The midway point of days between a listing going on the market and accepting an offer. Half were on the market longer; half were on the market for less time. Number of New Listings New home listings during the month(s) specified. Note: Sales were compiled on April 8, 2019, from Maine MLS data from sales of single-family homes. Data based on information from the Maine Real Estate Information System, Inc. (d/b/a Maine Listings) for the period January 1, 2018 through March 31, 2018, and January 1, 2019 through March 31, 2019. Yikes! Median sales price and number of homes sold in the first quarter are both down from a year ago in Cumberland County! Last month's rolling quarter stats showed sales prices leveling off a bit, with just a 0.45% increase in price. A 2.34% drop in median sales price, while isn't a huge decrease, it's definitely an indicator that things are starting to level out. Total sales declined quite a bit, with 90 less sales compared to the same period a year ago. Cumberland County saw a similar percentage decline, though values in York County increased by more than Cumberland County (6.89% increase in York County vs. 0.45% increase in Cumberland County). The number of new listings also stayed roughly even compared to a year ago. We started seeing a buyer rush in March/April last year, so I'm anxious to see what the coming months have in store. Note: Sales were compiled on March 13, 2019, from Maine MLS data from sales of single-family homes. Data based on information from the Maine Real Estate Information System, Inc. (d/b/a Maine Listings) for the period December 1, 2017 through February 28, 2018 and December 1, 2018 through February 28, 2019. Total sales declined quite a bit, with 112 less sales compared to the same period a year ago. York County saw a similar percentage decline, though values in York County increased by more than Cumberland County (6.89% increase in York County vs. 0.45% increase in Cumberland County). The number of new listings also stayed roughly even compared to a year ago. We started seeing a buyer rush in March/April last year, so I'm anxious to see what the coming months have in store. We saw an increase of almost 100 sales compared to a year ago, along with a slight decrease in number of new listings. These two factors helped to drive up the median sales price above 10% compared to a year ago! Note: Sales were compiled on February 12, 2019, from Maine MLS data from sales of single-family homes. Data based on information from the Maine Real Estate Information System, Inc. (d/b/a Maine Listings) for the period November 1, 2017 through January 31, 2018 and November 1, 2018 through January 31, 2019. Buyers and sellers both rushed to close out the year with a move as new listings and number sales both saw increases compared to a year ago. Values continue to climb, though not as dramatically as York County. We typically see a drop off in January and February, after a rush in November and December, so both new listings and number of sales are expected to drop in the coming months, though I see no indication that there will be a slowdown compared to a year ago. Sorry for the big gap in reporting stats! I started working on my new website (welcome!) and then our multiple listing service changed which changed how I obtained and reported statistics. I haven't yet figured out how to implement the "Number of New Listings" and "Median Days on the Market" has been replaced with "Average Days on the Market". Not a huge change, though those listings with 365+ days on the market before being sold definitely skews the data. I will work to find a way to report on these statistics in future updates. For this edition of The Goff Report, we'll look at all of 2017 compared to all of 2018. 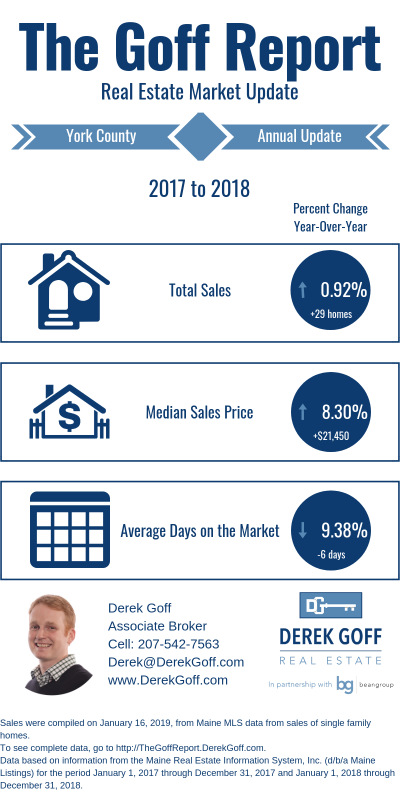 As you'll see from the graphic above and the table below, sales were only up slightly which helped contribute to the median sales price jump of 8.3% in York County in 2018. Mortgage rates are the lowest they've been in 9 months, and the government shutdown hasn't affected most home sales, so I don't envision any major turns in the market in the near future. We'll return to rolling quarter updates for next month! Average Days on the Market: Theaverage number of days between a listing going on the market and accepting an offer. Note: Sales were compiled on January 16, 2019, from Maine MLS data from sales of single family homes. Data based on information from the Maine Real Estate Information System, Inc. (d/b/a Maine Listings) for the period January 1, 2017 through December 31, 2017 and January 1, 2018 through December 31, 2018. For this edition of The Goff Report, we'll look at all of 2017 compared to all of 2018. 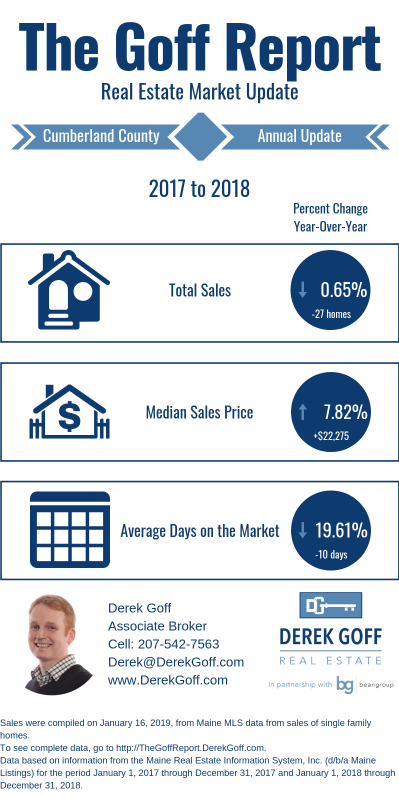 As you'll see from the graphic above and the table below, sales were down slightly which helped contribute to the median sales price jump of 7.82% in Cumberland County in 2018. "Derek Goff is the best of the best. We were nervous about starting the process of buying our first home, but Derek went above and beyond the duties of ... more "
"I always said to my husband that if we ever sold our home, I'd drive the agent nuts, based on some of the listings I see on line.....typos, bad pics, ... more "
"I cannot recommend Derek enough! He was absolutely amazing through both the selling and purchasing of our homes. He was so great about setting up ... more "